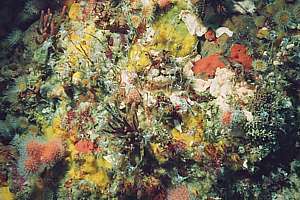 The third 50 visual examples of degradation, beginning with various aspects of plankton blooms. For comments, corrections or suggestions, please e-mail the author Dr Floor Anthoni. f040629: Truelove Reef on the outside of the Cavalli Islands show the exuberance of what once lived closer inshore. Yellow boring sponge in competition with colourful jewel anemones, all thronging for space. But this is but a small remnant of what once was. f036018: Where living conditions are best, one finds the 'leftover species' showing what was more common. This shaded wall of a narrow canyon shows heavy competition for space, a sign of health. 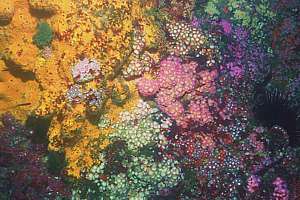 Species of several phyla. Mimiwhangata. f027320: Milford Sound is going through a period of rapid degradation as shown by its underwater life. Only close to the entrance some normality can be found, but most of it is in serious stress, like this almost dead black coral tree which is also infested by red seaweeds. In this area large coral trees are found completely lifeless. f026029: a recent but widely spread scourge is brown Ostreopsis slime, a planktonic dinoflagellate scum extending from halfway the picture downward. It makes sea urchins sick and kills them. 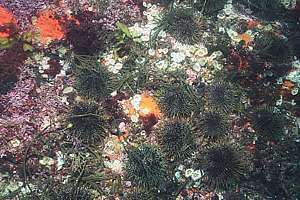 All urchins shown here have their spines folded as a sign of ill health. The one below is dead although still attached to the rock. Poor Knights Dec 2000.
f040635: where seaweed is plentiful, sea urchins live entirely from storm-cast seaweed, without grazing their patches, as shown here. With their top tubefeet they grab and hold seaweed that passes by, to be eaten later. f040701: the barren zone where urchins live (urchin barren) is created mainly by storms, but urchins maintain and widen these barrens. 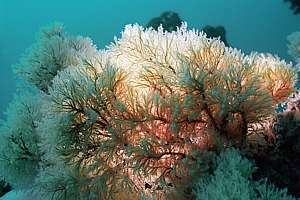 The scruffy seaweed is flexible weed (Carpophyllum flexuosum), ripped and torn by storms. 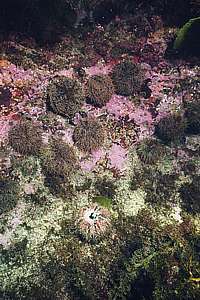 During prolonged calm periods, this seaweed can grow tall, above the grazing urchins who cannot chew their tough stems. 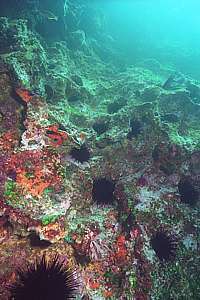 f029902: the large purple urchin (Centrostephanus rodgersi) lives in clear waters, but because of its large size, lower down than the green urchin (Evechinus chloroticus). When grazing is inadequate, first a green algal scum appears as shown here. Poor Knights. f033635: this hole used to be full of crayfish. At one time we counted thirty. Now a loner remains with a broken sea urchin from a recent meal. 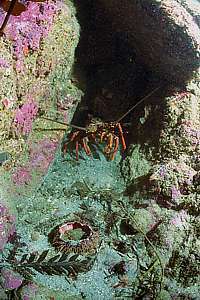 Crayfish break into sea urchins through the soft mouth underneath and in order to do this they must remove the urchin from the rock first. That's why they prefer to eat sick or dying ones. Leigh. f018026: a beautiful jason nudibranch (Jason mirabilis) is browsing for the last live polyps on this hydroid tree (Solanderia sp.) as it has eaten all others. 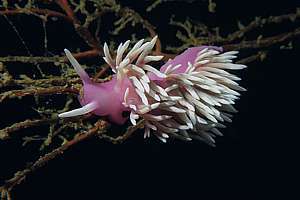 These sea slugs eat only this particular species of hydroid and their life cycle depends on it entirely. We found that degradation upsets this relationship. 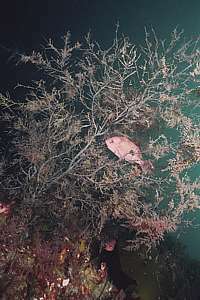 f036622: a very large and healthy solanderia hydroid tree stands in the current but jason nudibranchs are absent (Jun 2003). 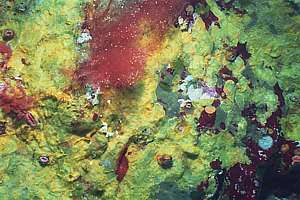 They have been absent for several years now (Dec 2005), which could be perfectly normal because even in healthy environments, they come and go periodically. f041111: near archways the habitat zones become compressed and easy to study. 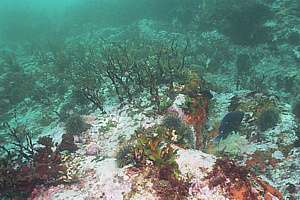 Here a habitat zone has changed and shifted location, accompanied by the death of organisms and fast growing yellow bryozoan mats taking their place temporarily. Such boundary changes are usually good indicators of changing environmental conditions, good or bad. In this case bad. 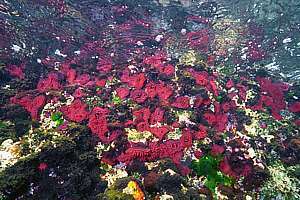 Poor Knights 2004. f029511: red actinia anemones are easily predated upon, one of the reasons why they live close to high tide level, as shown here. These animals are fat and healthy but they disappeared later (2002, Poor Knights). Our measurements have shown high bacterial activity in shallow water, which could have been the cause of their disappearance, but an oil slick could have achieved the same. f042807: a black angel fish (Parma alboscapularis) above green sea lettuce on which it feeds. 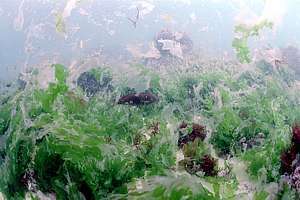 But the sea lettuce meadow is unusually large and dense, an indication that there are not enough grazers. 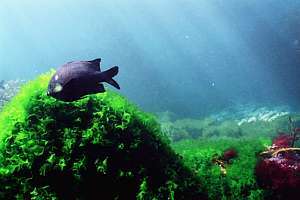 Both fish and sea urchins have died in recent times (2004) from sick plankton but the black angelfish has been spared because of its selective plant diet. f045224: when insufficiently grazed, seaweeds rot away like this green sea lettuce (Ulva lactuca), its rotten leaves floating around like wet toilet paper. Wherever rot is present, decomposing bacteria flourish, and like a rotten apple in the fruit bowl, they affect other organisms nearby. Rotting plants are a sure sign of serious degradation.